If you ever happen to spot a lightly worn, white cart stacked full of alcohol on your nightly adventures, be sure to stop the person pushing it for a drink. In a city full of curious watering holes, bar-on-the-go Twillo has to be one of the most eccentric. 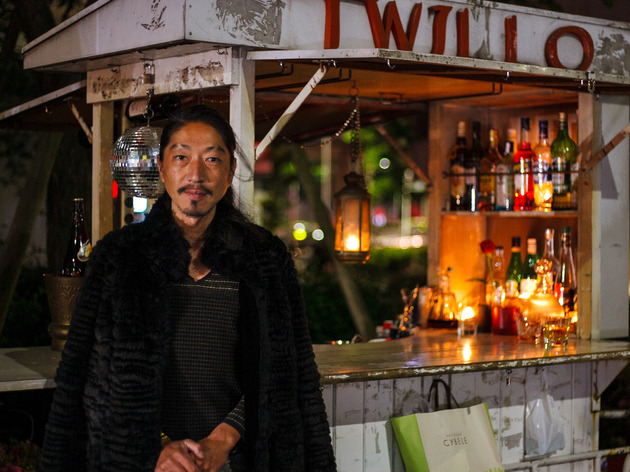 Mixing drinks in candlelight and pouring them into Baccarat glasses is Shotaro Kamijo, who has been roaming Tokyo’s streets with his cart since 2006. 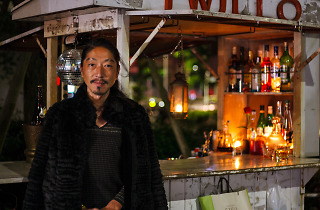 After stints as a banker and a secretary for the Japanese Diet (parliament), Kamijo decided to go into the mobile boozing business after looking for a job that would give him three things: opportunities for self-realisation, freedom and a living wage. At first, he camped out at the gingko tree-lined street in front of Meiji Jingu Gaien park, 365 nights a year, come rain or shine. After taking a two-year break to explore running for parliament, Kamijo now travels across the city every night, publicising his current location only through poetic entries on his Twitter feed. Although finding Twillo can be devilishly difficult, especially if you don’t read Japanese, it’s absolutely worth the trouble. Kamijo serves up a snappy selection of beer, wine, spirits, cocktails and Cuban cigars. The magic of Twillo is in its power to turn a piece of any old city street into a party place by drawing in passers-by from all walks of life for new and unlikely encounters. Although pushing the cart around unfamiliar neighbourhoods and starting out fresh every night can feel tough at times, the man behind Twillo says he loves what he does. ‘Meeting a diverse cast of customers makes it all worth it,’ Kamijo assures us. Keep your eyes open after dark and you just might find yourself stumbling upon his outlandish operation.